Weekend Recap: Running, Friends, and Family! First off, check out my guest post over at All Things Girl! I started off my weekend with a bang! I went to the park after work on Friday and FINALLY ran 1.5 miles straight through! 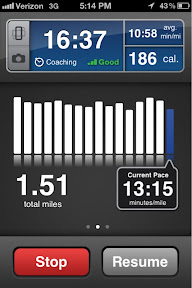 I probably could have gone a little more…but when my phone “dinged” that I had reached 1.5 miles, I did a little jump for joy…and my phone fell off my waistband. I had to stop and pick it up…and it screwed my my momentum! ha! Oh well. Next goal is 2 miles straight! Then I got myself ready and met up with some local bloggers. 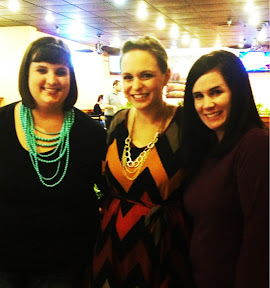 I had wanted to meet some blogging friends (see 30 Before 30 list) but this was WAY more fun than I expected. I mean, I expected some good conversation, but there wasn’t a silent second with these two. We had the best time! We ate Mexican food and sat for two hours chatting. Can’t wait to do it again! I came home and Tyler and I had a pretty low-key night. I worked on my Zumba Facebook page while he played on his iPad. Then we turned off all the electronics and talked for a while. Pure bliss. I love unplugged evenings. Saturday, I turned into Super Cleaner. I mean, I was up at 8 and didn’t stop until 1, when I started working on a quilt. 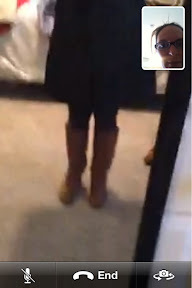 After cleaning, I got ready and headed to town to meet Tyler. I let him take me on a “surprise” dinner outing. We just got in the car and I told him to go wherever he wanted. We ended up at Landry’s. Hello carby goodness. I ate entirely too much Cajun food, but it was GREAT. 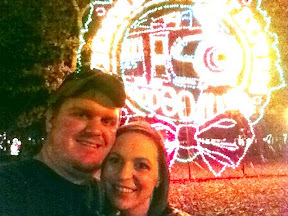 Then we went to Creekmore park to look at the Christmas lights. It wasn’t quite dark enough when we got there…so we went next door to Sweet Bay Coffee to talk for a bit. 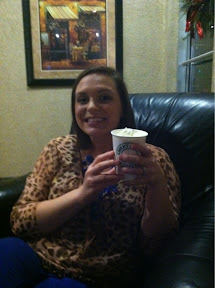 Delish sugar free white chocolate mocha! YUM! There is about a 3/4 mile trail around the park, and there are lights everywhere! My favorite was bull riding Santa. Only in Arkansas. We had a GREAT date night, and because we started at 4:30 after Tyler was done working…we were home by 8! ha! Sunday, I worked in the nursery with the 2 year olds! They are so fun! Then we went into Oklahoma to Tyler’s grandpa’s. 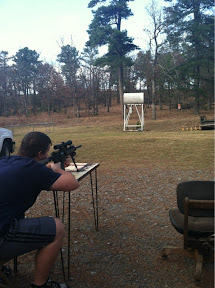 We shot the big AR 15. 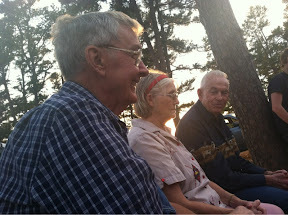 And listened to the older generation tell stories. 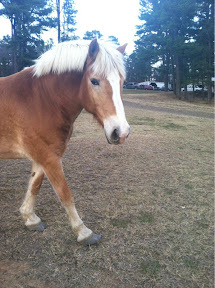 The funniest was when we were digging around the barn looking for something…and found this. Cottontail rabbit calls. 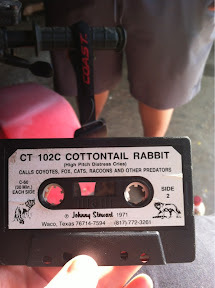 “Calls coyotes, fox, cats, racoons, and other predators.” A cassette tape rabbit call. Classic. We ate BBQ, played games, and hung out until just after 8, and then we headed home. A GREAT weekend. I didn’t want it to end! What a fun weekend! 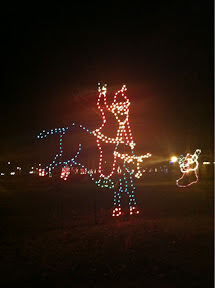 Love the Christmas lights! Oh, Oklahoma! We routinely go there to shoot big guns too. Fun! Crazy about the open carry now but honestly, I’d rather know someone has a gun than a concealed carry.